The generalized databank contains information on the defenders of the Fatherland, who died and were missing during the Great Patriotic War and the post-war period. 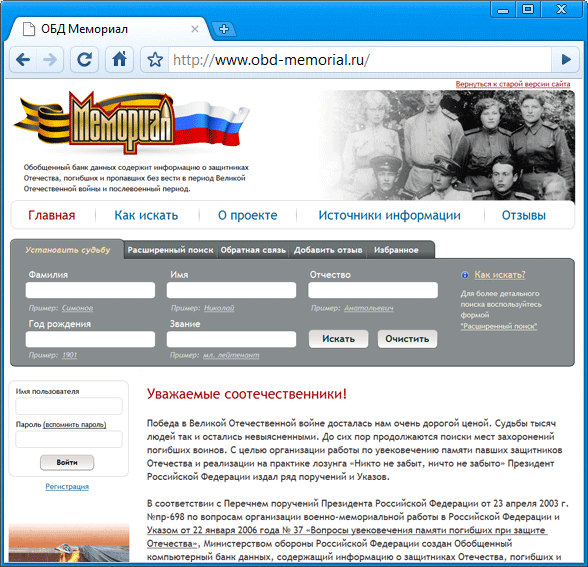 To date, 11.8 million digital copies of documents on irreversible losses of the period of the Great Patriotic War from 35 980 archives of the Central Committee of the Ministry of Defense of the Russian Federation, TsVMA, RGVA, GA RF, regional archives of Rosarkhiv and 31 590 passports of military graves of existing military burial sites in and outside the Russian Federation. Comparing information from all these sources will complement and refine the data from the source - front-line reports of losses. In addition, wide access to information about the victims and Disappeared warriors through Internet documentary refutes the falsification of pseudo-historians regarding the number of losses of the Soviet Army during the Great Patriotic War.